"The Americans should proceed with their next acts thoughtfully and realistically, because otherwise Iraq’s security situation will worsen and cause Iran not to co-operate with them in this regard,"
foreign ministry spokesman said. He was referring to the brief detention by US forces of a group of Iranians, including two diplomats, who were seized in blindfolds and handcuffs from their Baghdad hotel on Tuesday. 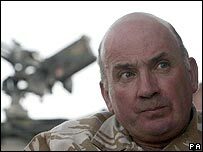 Comments by the head of the British army, General Sir Richard Dannatt, that his forces are stretched in Afghanistan and cannot deploy any more soldiers will only increase pressure on the British government to hasten its withdrawal from Iraq. Iranian President Mahmoud Ahmadinejad said on Tuesday that from Tehran’s point of view Iran’s nuclear case is closed. Iranian President Mahmoud Ahmadinejad said on Tuesday that from Tehran’s point of view Iran’s nuclear case is closed. "I announce officially that from our point of view Iran’s nuclear case has been closed," said President Ahmadinejad in a press conference. Are Bush & Co. Gearing Up to Attack Iran? By Ray McGovern, AlterNet. Posted August 23, 2007.A former CIA analyst estimates the chances of an attack on Iran and shows that the mainstream media is already cheering it on. In short, it seems possible that Rove, who is no one’s dummy and would not want to be required to "spin" an unnecessary war on Iran, may have lost the battle with Cheney over the merits of a military strike on Iran, and only then decided — or was urged — to spend more time with his family. As for administration spokesperson Tony Snow, it seems equally possible that, before deciding he had to leave the White House to make more money, he concluded that his stomach could not withstand the challenge of conjuring up yet another Snow job to explain why Bush/Cheney needed to attack Iran. There is recent precedent for this kind of thing. We are left with a president who cannot actually govern, because he is incapable of reasoned thought in coping with events outside his control, like those in the Middle East. 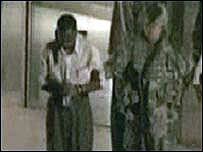 Posted in Uncategorized | Tagged: News and politics | Comments Off on Are Bush & Co. Gearing Up to Attack Iran? Buried in the files for more than two years, a withering internal assessment of pre 9/11 intelligence failures is finally made public.